And it came to pass, when the mini-van peoples began to multiply on the face of the earth, and many sons and daughters were born unto them. 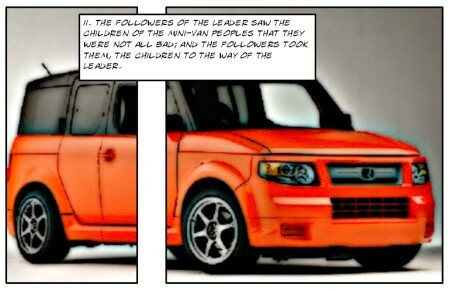 The followers of the Leader saw the children of the mini-van peoples that they were not all bad; and the followers took them, the children to the way of the Leader. And the Leader said, My way does not walk in the path of your parents, though they are also of the same flesh as we. The Leader saw that the wickedness of the mini-van peoples was great in the earth, and that every imagination of the thoughts of their hearts were evil. He saw that the mini-van peoples were of unrepentant nature, and it grieved Him at His heart. The earth was corrupt with mini-vans, and the earth was filled with the peoples of the mini-van. And the Leader looked upon the earth, and behold, it was corrupt with their ways. The Leader said unto the repentant, Although the earth is filled with min-vans, you must have hope and look unto me for guidance. Make thee chaste and with thine own monies put them not towards a mini-van but towards an automobile. In this fashion you will be pardoned. Maketh My word known unto thine enemies. Purchase thee a vehicle of small stature. Doors of four or two and thou shalt place therein thyselves and thine companions. And in this fashion which thou purchase, make it known unto them, the mini-van peoples why you have chosen thusly. If thou thinkest wherein is cargo to be place and thou is plagued by the event. 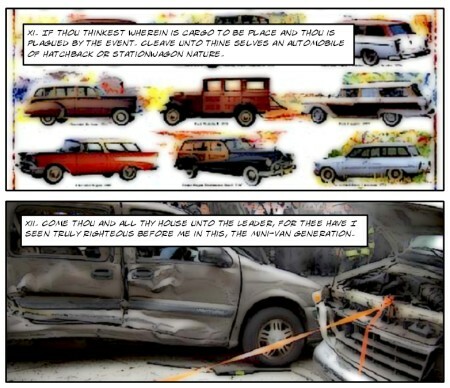 Cleave unto thine selves an automobile of hatchback or stationwagon nature. Come thou and all thy house unto the Leader, for thee have I seen truly righteous before Me in this, the mini-van generation. And the fear of you and the dread of you shall be upon every minivan of the earth, and every minivan driver and upon all them who travel in such fashion. Into my hand you have been delivered. The Leader went forth , and saw a great multitude, and saw that they had followed him on foot out of the cities of the minivan peoples. He was moved with compassion toward them and he blessed their chosen vehicles. And when it was evening, Number One and Corporal Punishment came to him, saying, This is a forest place and the eve is upon us, send the multitude away that they may rest within thine own shelters and have meals within. But the Leader said unto them, They need not depart for we have much to eat. And they say unto him, We have here but one case and two parcels of nourishing fried potato. The Leader said, Gather them unto me nearest our home fire. 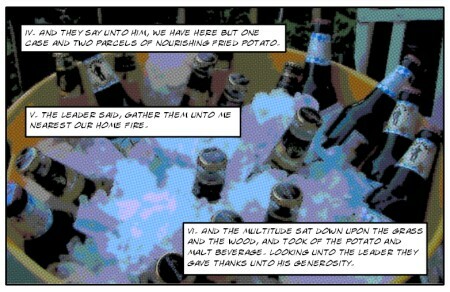 And the multitude sat down upon the grass and the wood, and took of the potato and malt beverage. Looking unto the Leader they gave thanks unto his generosity. They did all sup and were filled; and they took up the fragments that remained. They that had eaten were many and the Leader provided unto them His own sustenance. For within the encampment of the Leader there is many a beverage to be had. The Leader spake unto Number One and Corporal Punishment, saying, This day shall be unto you the beginning of all days: it shall be the first day of the new life. Having spoken, the Leader left the Pit of their meeting and went unto the new day. The Overseer of the pit and his chosen ones found but only minimal fault in the ways of the minivan peoples. Wherein the pit they swarmed without penance and took unto themselves the excess and products of the pit. Number One was to follow next, having seen the new day, which the Leader had spoken of. Having seen that penance would never be properly paid by the merchants and guests of the pit, Corporal Punishment also left the pit and went herself unto the new day. Together went the three unto the new day. 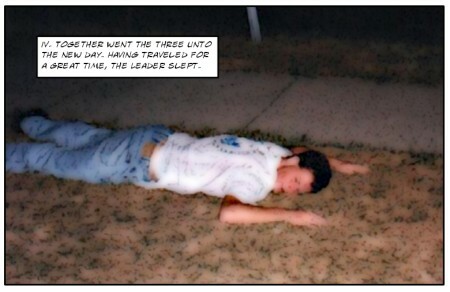 Having traveled for a great time, the Leader slept. As the Leader rested himself, Number One and Corporal Punishment rested themselves also. Upon waking, the Leader was afraid and woke the two and shared his vision. There is one upon us, within the peoples of the minivan who to them is chosen. Who walketh upon this land and speaketh in favor of the minivan peoples for they bring prosperity to the pit. They, my followers that overcometh this chosen one, and keepeth my word, to them I will give favor and pardon. The Overseer of the pit is not a just follower. Nay not even a follower! For in my vision I saw him that sat upon a throne. And he that sat looked down upon the pit, and round about the throne laid his chosen one. The chosen one encircled the throne and smiled upon the Overseer. After which the Overseer makes him the ruler of the tenants. The chosen one who encircled the feet at the throne, was with many faces not seen unto the Overseer. Yet I saw and know of his interest. For it is his wish to be not unlike his father and seeks a bride of youth and vigor. With which to breed more like themselves unto the peoples of the minivan. Also within the pit he sees the produce and excess that is his means and sees the clothing. And brags to all, that the excess that is the undergarments is not fit for such a being as he, causing a fear among the tenants of the pit. For they the tenants would not consider these most small underthings to be of use for anyone, but the chosen of the Overseer. The tenants are wise and see his many faces. The chosen of the minivan peoples say unto the tenants, Who would be a fit bride for me? For there are only two among the tenants who are of correct nature. One tenant had in his hand a portion of wit and spoketh to the chosen in response. They whom you deem worthy are not to be your choice. For they are wise to your many faces. And this tenant is one who leaves and sees a new day. It was a wise choice that you, Number One and Corporal Punishment, came unto the new day. For remaining in the pit will bring about the many faces of the chosen one, he who is chosen of the minivan peoples. He who is smiled down upon by the Overseer and made to be the ruler of the tenants.